It’s time for Friday Fictioneers, and our hostess Rochelle has given us a retread prompt from the days before I played along. If you are new to this concept, you can learn more here and play along here. The photo prompt this week came from Madison Woods, and my 100-word story follows. By some stroke of luck, I didn’t recognize celebrities the first time I met them or that famous producer’s name during our online encounters. 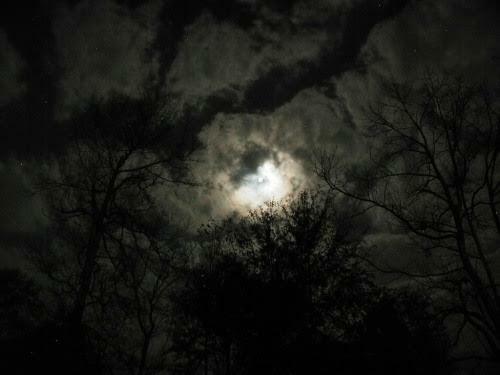 The moon raged, but no stars clouded my vision. By the time I achieved name recognition, the famous had become friends, colleagues, nemeses, alter egos. We learned together how heroes fall. Author’s Note: After spending high school and college listening and performing to contemporary Christian music, I found myself in the company of several notable celebrities without intention. Although this story isn’t autobiographical, it deals with some of the issues common among religious performers. It turns out you can’t keep up a charade forever. It turns out that we are all human. That doesn’t make the art we humans produce less meaningful, but it can cause a huge wad of problems for anyone who puts another human on a pedestal. First, “The Raging of the Moon,” with lyrics inspired by the fall of Communism. Remember when we thought the fall of the Berlin Wall was the end of all our problems? Next, “Hero” by Steve Taylor, with lyrics that say what I meant to say, maybe better than I did. In 2014, I managed to take a nearly defunct blog and generate a modicum of interest among a small but growing circle of readers and writers. In 2015, my goal is to regularly post flash fiction stories twice a week. One of these posts will be related to the weekly Friday Fictioneers prompt. The other post will be crafted from inspiration that comes to me throughout the week. This week I am drawing from one of my favorite lyricists and one of my favorite historical characters. First, comes the music video for Steve Taylor’s song “Sock Heaven.” The story and a mural featuring Frida Kahlo follow. 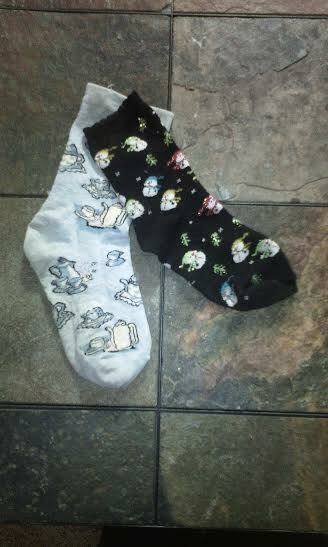 Finally comes the picture that started this entire foray into existential thought, a photo of two mismatched socks. Until she read the biography of Frida Kahlo, Cassie didn’t believe in Sock Heaven. Afterward, she realized that Frida deserved some sort of paradise, and if a heaven for misfits existed, surely Cassie would be on the guest list as well. Compared to Cassie, Frida seemed relatively normal. But the artist thought herself strange, and Cassie had likewise often thought how abnormal she herself was. Cassie and Frida, despite being born nearly a century apart, had more than strangeness in common. Polio and a series of accidents rendered the artist a cripple. Cassie was born with club feet and often found walking difficult. Frida, undaunted by ambulatory challenges, participated in boxing and other sports. Cassie’s dream was to become a dancer. Artistic by nature, she spent her childhood writing and acting. As a young adult, she learned to dance. She fought demons with poetry, and, like Frida, experienced more than once the condemnation of conventional wisdom that had no place for strange women. The two met half a century after Frida’s death on a day when Cassie stared into the gaping mouth of hell. 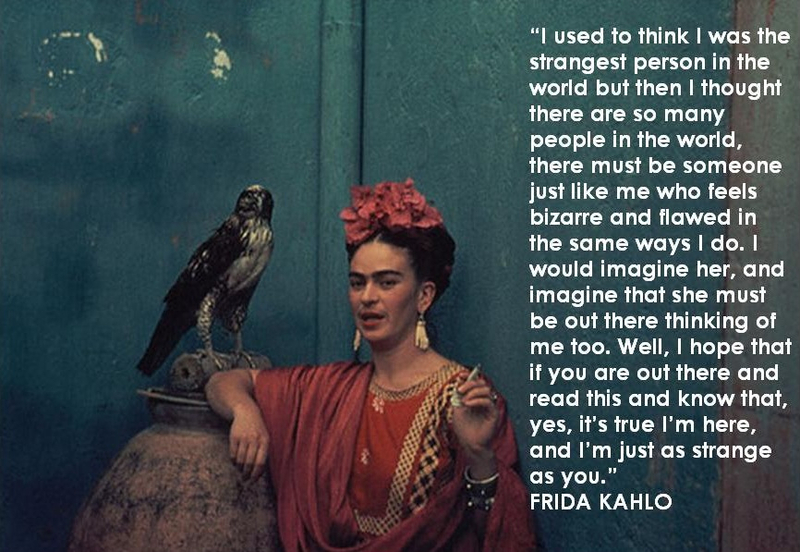 She happened upon a quote from Frida Kahlo and began to think about other possibilities. She began to feel less lonely, less afraid, less strange. She read Frida’s biography, drank in the crippled woman’s self-portraits, made a friend from beyond the grave. In time, she began to see that both heaven and hell are exactly what one makes of them. It seemed to Cassie that she and Frida had both spent too much time in someone else’s hell. Why shouldn’t they find a place in Sock Heaven? Frida’s husband, Diego Rivera, painted this mural of her.